What a busy summer - I can't believe Summer Reading Club is over for the year. It was certainly a challenge... my first year at my current library, with a programming and prizes budget reduced to nearly zero, and very little time to plan. I think it went as well as could be expected. I managed to scare up some local performers who were willing to put on programs for free, and ransacked our supply closets for craft supplies that I could repurpose. Most of our summer reading program was accomplished through sheer ingenuity. You know that old saying, you can have things fast, or have them cheap or have them excellent, but you can only pick two out of the three. I opted for excellent, thrifty, yet time and labor intensive programs. Here are just a few highlights. The Summer Reading theme this year was One World, Many Stories, and I started by making a Passport Craft for kids. I had planned to do a Mexican Paper Flower Making craft, using up the last of our tissue paper and chenille stems, but was stymied by much larger and younger crowd than I expected. 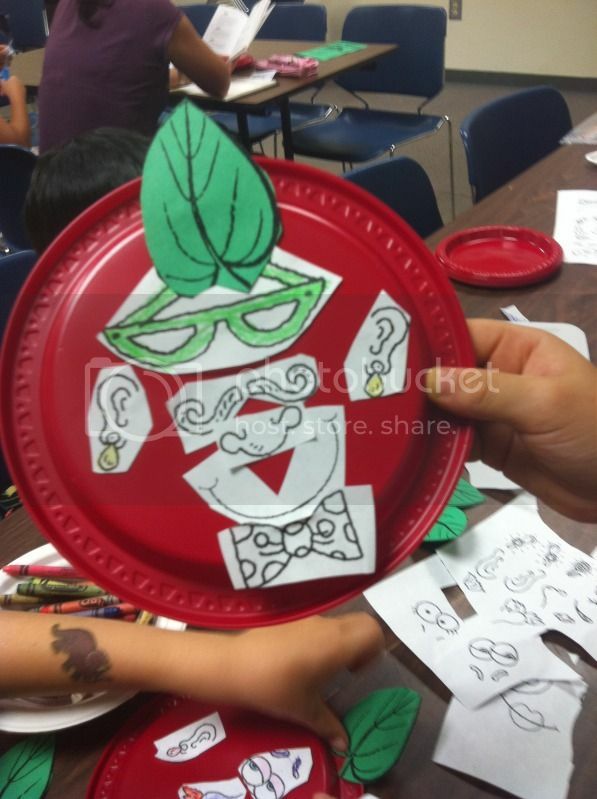 The planned craft proved too difficult for most of the 3 and 4 year-olds who showed up, so I pulled out my "emergency kit" containing some coloring pages, and a simple caterpillar craft, where kids simply had to glue a precut caterpillar and leaf onto a floral scene. 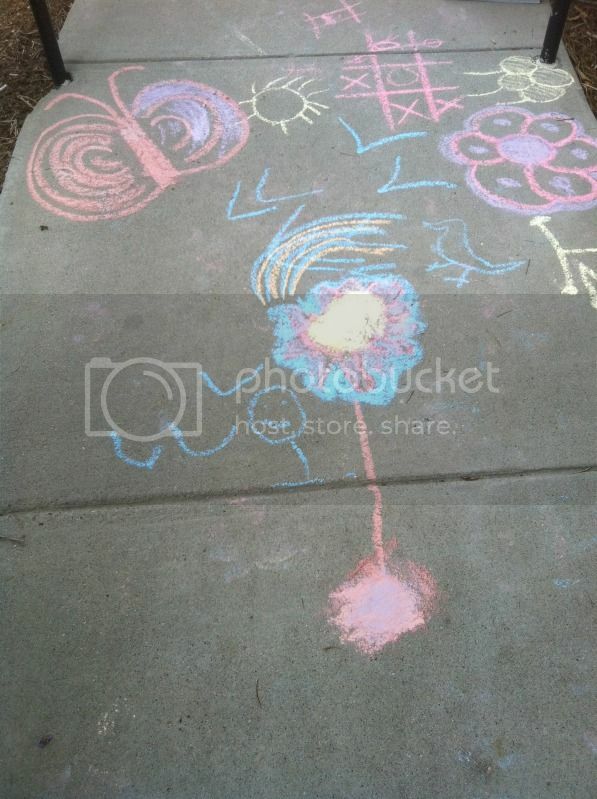 Mostly, I stuck to affordable fun - the Sidewalk Chalk Art Expo that we hosted at the library was very successful. Patch.com even covered it in their local news. We also hosted a well-attended Spelling Bee. The toughest part was coming up with lists of words, and deciding their difficulty beforehand. Here's a picture from the International Apple Craft we did. I read How to Make an Apple Pie and See the World, and then invited kids to make their own apple faces, Mr. Potato-Head style, using red plates as our background. A huge part of summer reading was managing people's expectations. A lot of parents (and kids) were bitterly disappointed at the paucity of prizes this year. I guess in years past, there was much better summer reading swag to be had. This year all I had were summer reading folders, bookmarks and a few stickers. I had some very uncomfortable conversations with folks who wanted to explain to the "new girl" that this isn't how Summer Reading Club is supposed to work. They did the reading, so where's the prize? I got through it by playing dumb, and remaining cheerfully psyched about Summer Reading. "Reading is the prize!" I informed them, and then might tell them how excited we were to have them sign up, how much Summer Reading helps kids with school success in the fall, so they don't have that summer gap, and then would solicitously inquire if they had gotten the free bookmark they were entitled to. In years past, I've used a couple of complicated systems for tracking how much kids have read over the summer - including counting minutes read, pages read, or my personal favorite, pounds of books read. Kids loved "weighing in" their weekly reads on a kitchen scale. This year, I kept things simple, simple, simple. Just write down 10 books read on one's summer reading log, and you're entered in the grand prize drawing. We handled it on an honor system, since I didn't have the time or energy to play policeman. I did double-check all the drawing slips before I handed them in to the Central Library, and did find several duplicates. I'm going to be big-hearted and assume that those who entered multiple times, must have done it by accident. I went ahead and made sure we only had one entry per child. Ultimately, I was really satisfied with our turnout. We had some respectable numbers, especially considering there hadn't been a children's librarian in the branch for so long, and so many families had started going to other branches in the interim. If I'm able to get similar size crowds next year, I'll be very happy. It's a comfortable number: busy enough to keep you on your toes, but with room to grow. Viva Summer Reading! "Reading is the prize" - good for you, Madigan!